The term “phantom poodle” does not refer to a specific breed or size of poodle, only to its color and markings. Phantom poodles are bi-colored, with the same markings as a Doberman. That is, they have a lighter color appearing on their “eyebrows,” muzzle and throat, legs and feet, below their tail and a bowtie on the chest.. For a dog to be classified as a phantom it must have all the markings of a Dobie. Phantoms are now recognized in the UKC show ring. Phantom poodles are also accepted by the AKC in various color combinations. Black can be combined with apricot, cream, gray, red and silver. Brown and tan can both be combined. No matter what the color combination, a dog’s coat must comply with the standards for phantom markings to qualify for conformation shows with the UKC. 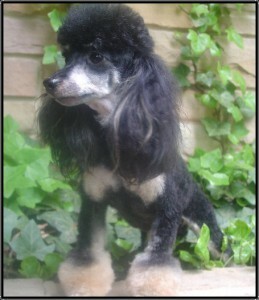 For an excellent example of a phantom poodle with bowtie markings, see the picture of Pride posted on our “Dams” page. Phantasie is an adorable phantom puppy whose photo can be found on our “Proud owners” page and Justy posted above. Of course, color and markings aren’t the most important aspect of choosing your poodle.